We install high-quality ProVia doors throughout Georgia. Visionaire Windows installs high-quality ProVia door replacements, offering four lines of fiberglass and steel entry doors designed for aesthetic appeal, security, and energy efficiency, as well as storm doors and patio doors. 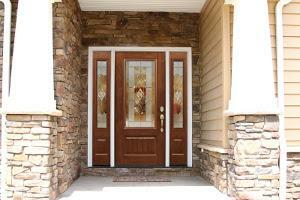 All of our door installations are available in a variety of styles, finishes, glass options and custom sizes. As your local window and door contractor serving Kennesaw, Marietta, Acworth, and nearby areas in Georgia, Visionaire Windows has the replacement door options you need! Contact us today to schedule your free, no-obligation cost estimate and learn more about our beautiful and durable door installations. ProVia doors installed by Visionaire Windows are available in a variety of styles and materials, and our door replacement specialists will work with you to find the perfect fit for your budget and your home's unique needs. Steel and fiberglass entry doors. ProVia won the ENERGY STAR Partner of the Year Award for Door Manufacturing, so you can trust that their fiberglass doors are some of the most energy-efficient entry doors in the U.S. Choose from beautiful fiberglass doors that look just like a classic wood door with additional strength and durability, or choose a heavy-duty steel door offering unparalleled security and high-definition embossing for an artistic texture and contour. Custom aluminum storm doors. Visionaire Windows installs ProVia storm doors featuring retractable screens and customizable details such as glass choices, color options, and more. Made from fully weatherproof material, these aluminum doors will not only boost your curb appeal but protect your home as well. Maintenance-free patio doors. ProVia offers aesthetically pleasing, low-maintenance patio doors in both sliding and hinged styles. Whether you're looking for a real wood interior with a vinyl exterior, an energy-efficient sliding patio door that will help you cut back on energy costs, or a fiberglass and steel hinged patio door, we have the solutions. Apply their Signet® entry doors, LegacyTM entry doors, and more to the style and appearance of your own home so that you can get a good idea of the final results before moving forward. The right kind of door installation will not only add durability and protection to your home, it will also help give a first impression as friends, family, and visitors enter your home. That's why the style and aesthetic of your entry door, storm door, or patio door is just as important as the sturdiness, energy efficiency, and quality of material! When you work with Visionaire Windows, you can have the best of both worlds. If you're ready to get started on your door replacement project, don't hesitate to contact the experts at Visionaire Windows today. We specialize in entry doors, storm doors, patio doors, and more, and we offer high-quality ProVia door products in a variety of styles and materials. Contact us today to schedule your free quote in Kennesaw, Marietta, or nearby in North Metro Atlanta!